What else? Well on Sunday, we went to the Museum to see the latest Egyptian Mummies exhibit. Whilst I liked it, museums are one of the things I miss most about home. Here, we have just one and the exhibits rarely change. Which isn’t a problem when you’ve got NHM, the V&A and the British Museum on your doorstep (not to mention all the other amazing museums across the UK and throughout Europe), but when there are only 3 permanent exhibits and 2 of them haven’t changed at all, it gets a little frustrating. Plus I find none of the exhibits here feel like the ones you get at home. I don’t know how to describe it but it just feels wrong. Anyway, I should stop complaining and move on. Speaking of, I did an IG story the other day apologising for my lack of book reviews. I’ve mainly been reading romance lately and I wasn’t sure you wanted to hear about that, but apparently, you do, so expect some of them very shortly! In the meantime, I thought I’d share with you my list of romance novels. I warn you now though, none of these are Little Women or Anna Karenina, they are all light reading chicklit, but I’m not even sorry! I was first introduced to this series when I picked up Christmas in Eternity Springs in November 2016. I was badly in need of a Christmas book and this hit the spot! Since then, I’ve read 5 or 6 of them and I’ve loved every single one. And I’m not going to lie, it was this series that finally gave me the push to write the book I currently have open on a tab on my screen! I’m pretty new to this series and am making my way through it as quickly as I can find the books! So far I’ve read 3 and also picked up a book from her Gansett Island series. All the ones I’ve read so far have been adorably written, with some seriously hot and steamy moments thrown in for good measure! Do I even need to give a reason for this one? I thought not! Make sure you’ve got those tissues handy! Y’all know my love of a DS book by now and this one always makes the list of my all-time favourite books. Why? Because it’s full of adventure, sacrifice and the power of true love to overcome all the odds. Y’know – what every great romance novel needs! Chances are, you’ve seen the film (if not, do it NOW) but if you’ve yet to read the book, you have to add it to your list immediately! Please, if you haven’t read this, do NOT expect it to be like the film. Because it’s entirely different. I kid you not. Same characters yes, and basic plotline, but that’s where it ends. The book is to-die-for. You will stay up all night weeping, laughing and then weeping some more, and it will be worth every tear shed. Trust me. I think the books are better than the movies, plus there’s a heap of stuff that gets left out. Besides, who doesn’t love falling in love with a vampire? Not me! 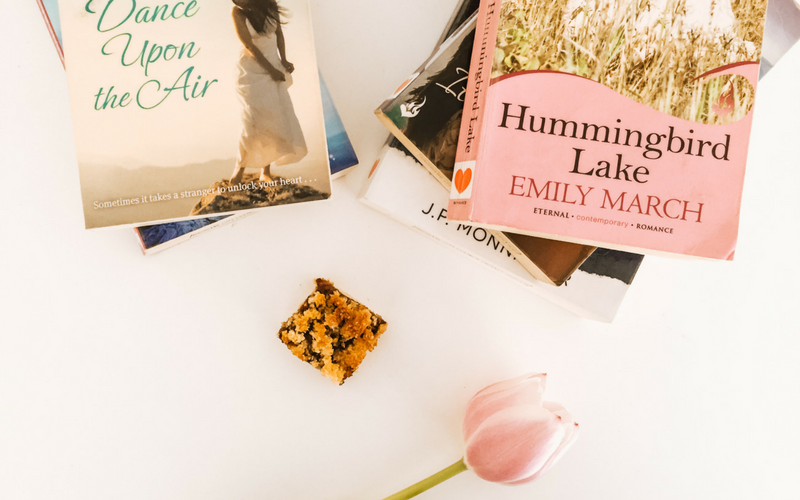 I couldn’t finish this list without a Nora Roberts book – it was just a case of choosing one – which was the hard part. This series is wonderfully written, full of the magic of weddings, friends and family. I read it at least once a year and it never gets old! And there you have it! What are you reading right now?